She first causes his execution and then saves his life. 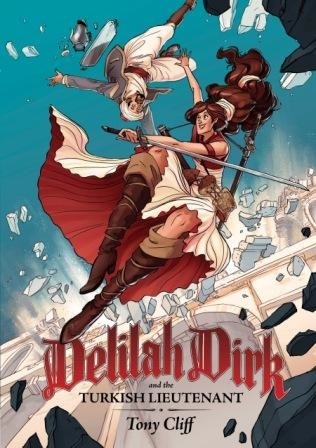 To repay that debt Selim the mild-mannered Turkish Lieutenant joins firecracker Delilah Dirk on her adventures, and thus a partnership is started on page 30 and they (and the reader) are off and running at breakneck speed on an adventure that sits squarely at the crossroads of Indiana Jones, Tomb Raider, Moonlighting, the Hope/Crosby Road movies, Buffy, and Robin Hood. In a wonderful inversion of the normal roles Delilah is the skilled thief who acquires a diamond-in-the-rough distressed damsel sidekick in the form of Erdemoglu Selim who prides himself on his ability to make great tea. They steal treasure, are pursued, lose treasure, steal more treasure, and each comes to the conclusion by the end that the greatest treasure is the adventures themselves. The story such as it is exists only to move along our “heroes” from one adventure set piece to the next. While the pace may be fast author Tony Cliff still manages to sneak in enough character bits to give us fully fleshed out characters and not just cyphers. Lately it seems to me that the big two are putting out nothing more than complex cross-connected stories you need to have read the last five years of continuity to understand. And the violence, blood, and language would rate at least a PG-13 rating on the big screen it is nice to find a self-contained, fun book suitable for all ages. This is a summer blockbuster of a book and I mean that in the nicest possible way. And speaking of younger readers…..
“The reason we have smaller numbers of comics readers is because we don’t have any comics for kids.“ How many times have you heard this? Despite what you’ve been told there are comics for kids, you just have to look a little harder to find them. And if you did find suitable titles what kind should they be to hook the little rugrats and breed a whole new crop of readers? My suggestion would be to take a bunch of stories that should be familiar and put them in a comic format that is perfect for parents to read to their kids before bed. And better yet let’s make it an anthology with a whole bunch of great artists such as Jaime Hernandez, David Mazzucchelli, Craig Thompson, and Emily Carroll to do the adaptations. First:Second Comics editor Chris Duffy must have had the same thought because he did just that when he put together Fairy Tale Comics. As a comics reader myself I realize that I have to do a lot of the work for the comics companies to help grow a new generation. 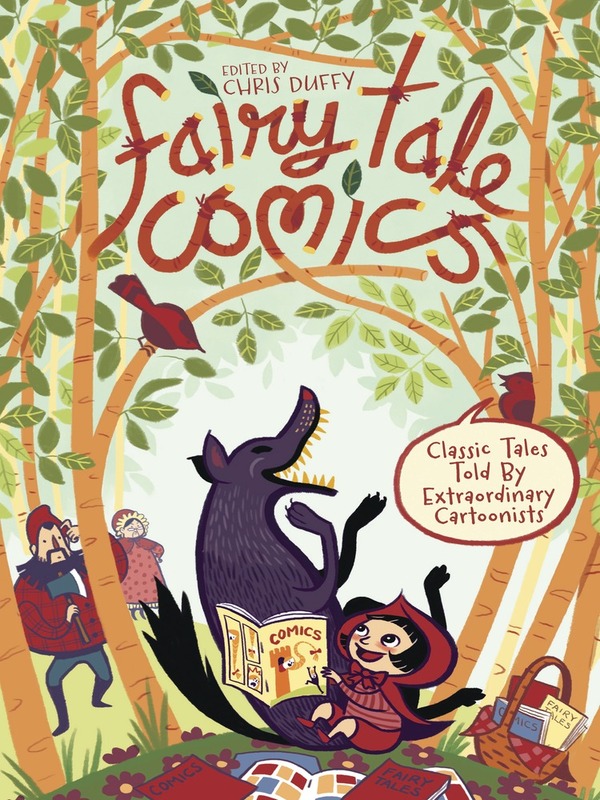 And obviously a book called Fairy Tale Comics isn’t written for someone in his late 30’s so I decided the only way to see how good it really was meant reading it to my 5 year old and over the space of a week we read one story after another. Did he enjoy every story? No, but he enjoyed many of them and by the time he was done he was asking me to reread some of them. Basically what I witnessed was the beginning of a new comics reader and I can’t give a title a better endorsement than that. If you have children find this book and buy it and share it, it really is that good.